Grief Journals: should picking a grief journal really be this complicated? Journaling is a tried and true coping tool for exploring grief, as well as other complicated emotions. Why does it work? There are a number of benefits. First, it helps us be more aware of our own emotions. Writing something down forces us to slow down and think about our thoughts. It can give us an opportunity to reflect on and better understand our own behaviors, emotions, actions, and moods. This means improved self-insight. Journaling can reduce stress, problem-solving, and improve sleep. Really! Getting things that are bothering you on paper can give you a distance from them. When you take the time to write them out you can gain new perspective or, at the very least, get racing thoughts to slow down enough to relax. Some people are journaling-superstars. They are often people who have always used writing as a form of self-expression, or feel very comfortable with free-writing. If this is you, grab a notebook and start writing. You probably don’t need our help. For those of us who are less comfortable, or need a little more structure to our writing, there is a wide array of grief journals on the market. One would think this was a good thing (which I suppose it is) except when you do an Amazon search for term “grief journal” and are faced with sixty results. SIXTY. I am feeling overwhelmed just thinking about it. I would love to say I have made this easy for you – that I have purchased and reviewed all of the grief journals available on Amazon and have the perfect recommendation. Though I do have a book-buying problem, and my husband would probably not be shocked to come home to find sixty grief journals delivered on the porch, I have not actually ordered them all. I do own more than my fair share though, so I am happy to share what I know. A disclaimer: Even if I had reviewed all sixty journals, I wouldn’t be able to say which is best for you. Journaling is very personal. Each person’s goals, expectations, and preferences in a journal will be different. This is just a little information to consider when you’re feeling overwhelmed by the sixty search results that pop up on Amazon. 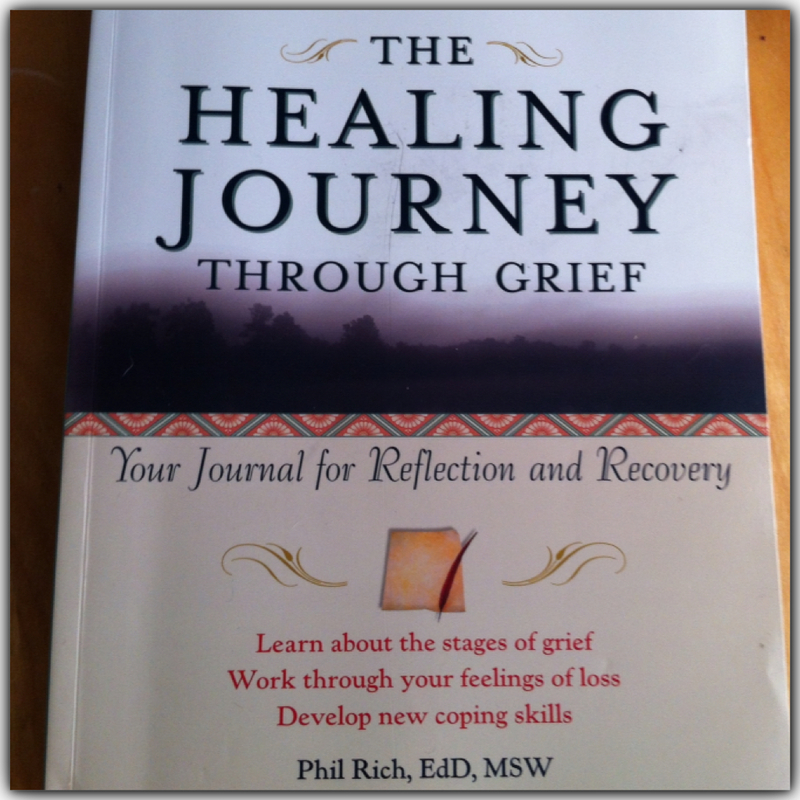 Below are six questions to ask yourself when picking a grief journal. I have structured my comments on each journal based on how someone would answer the following six questions. Are you a writing person or an art person? Do you like lots of concrete, specific prompts or broad, open-ended prompts? What is more important to you: working through emotions or documenting memories? Do you want your journal to focus exclusively on your specific loss or do you want it to focus on a range of experiences? 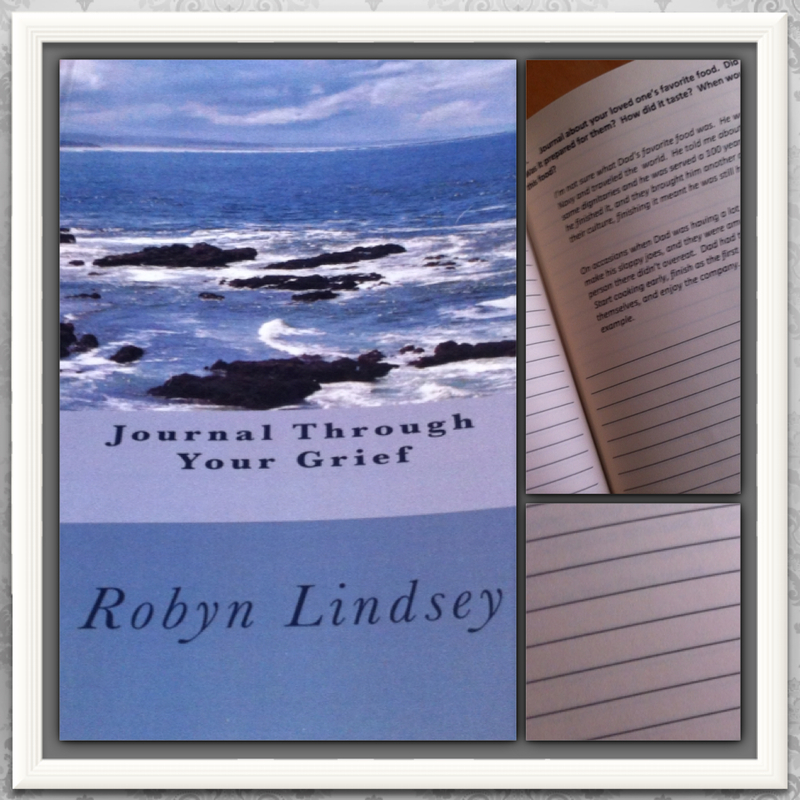 Do you want a journal that also provides information about grief and loss? Is it important to you that your journal is aesthetically pleasing? This journal could work for you either way. The pages provide big open spaces (not lines) so they could be used for writing, drawing, collaging, doodling – whatever! This is a journal for people who are looking for just a few, broad prompts. There are some good “journaling suggestions” in the front of the book, but each page is basically blank with a quote. The quotes are about grief, inspiration, et ceterra but are not prompts. This lends itself to someone who does not need as much guidance and wants a lot of freedom and flexibility in a journal. What is most important to you: working through emotions or documenting memories? Because this journal has so few prompts, it could be whatever you make it. Again, this journal is very broad so you could choose to focus on the loss exclusively or journal about other things. This journal has a couple pages about grief, including some common emotions associated with grief. But overall it is primarily a journal and does not provide a lot of information about grief and loss. This journal is pretty. It is pink (so if you are a pink-hater you have been warned) but if you remove the book jacket it is a plain, light green. Each page has a nice border (also green) and there are some images throughout. Other Comments: This journal does include my favorite Buddhist parable, so extra points for that! It also is a nice size: large enough but not too big to fit in a medium-sized purse. It is hardcover, so it feels sturdy. This is a writer’s journal, for sure. Very little blank space and all response areas are lined. This journal is perfect for someone looking for very concrete, specific prompts. I have no interest in quibbling over what constitutes a journal, but I will say that I would have called this a workbook had someone asked me to title it. 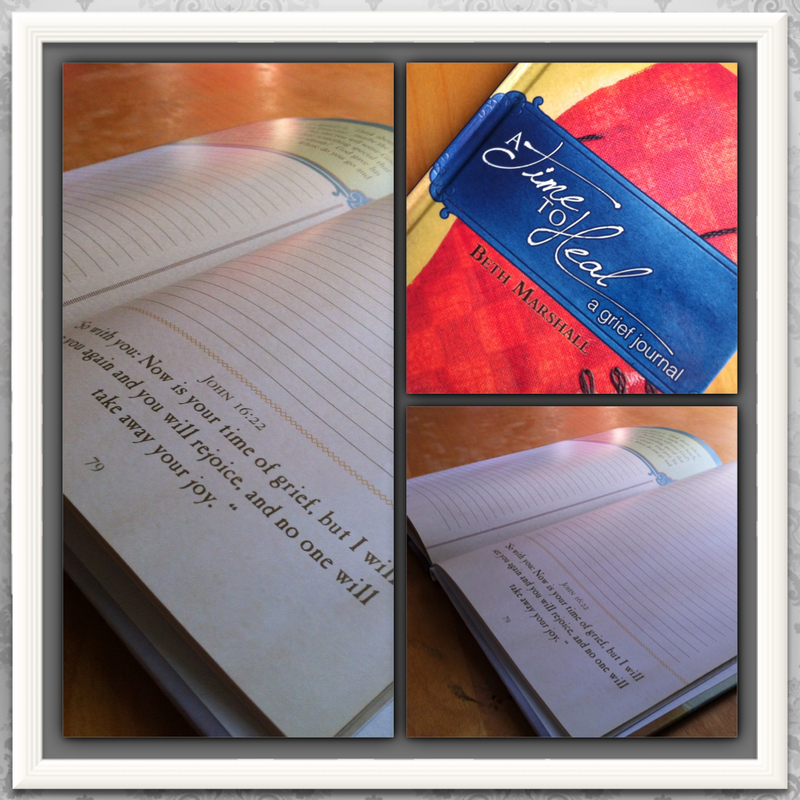 It is great for people who are looking for guidance and direction in their journaling. This journal/workbook is great for both. At 256 content-filled pages, it covers everything you could want and more: feelings and emotions, coping skills, memories, regrets, meaning, and much more. This book focuses on the loss primarily. Though some of the prompts encourage self-exploration that has implications for coping with a range of emotions, I would recommend it for people looking for a journal very focused on a specific loss. This journal is jam-packed with information about grief. If you are a person who wants to know why you are doing a certain exercise, this is the book for you. Each section of prompts is prefaced with information and closed with things to think about. 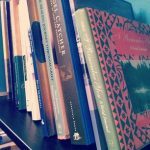 If you are debating between a journal and a book about coping with grief, this could offer you the best of both worlds. This is not a cutesy journal. It looks more like a workbook or text book. The pages are content-heavy. That is great, because you get a lot of content, but it does make for a text-heavy book with narrow lines for responding. Other Comments: This is a great journal for someone who is looking for structure, guidance, and to potentially learn and develop new coping skills. It is very comprehensive, but it does feel more like a workbook and may not be a good fit for someone extremely creative. This journal could go either way. There are no lines, so you could respond to the prompts with words, pictures, drawings, collages, etc. Depending on the prompt you typically have a full page, half page, or third of a page for your response. This journal is a nice balance. It has plenty of prompts (at least one per page, often two or three). Some are very specific, others are more open ended. This journal provides a nice balance. There are prompts to explore thoughts and feelings, as well as events (such as visiting a grave site, bad days, the one-year anniversary, etc). They explore memories, from food the person liked, to sayings they used, to the last conversation you had. This book focuses on the loss primarily and the person who died. 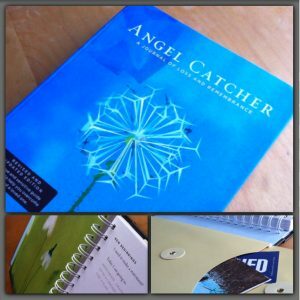 The same authors have another journal, Soul Catcher: a journal to help you become who you really are, that may be good for those looking to journal about more than just the loss. This journal does not contain a lot of information about grief and loss. 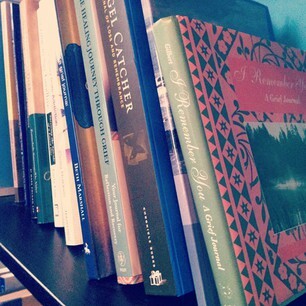 It does provide a reading list in the back of helpful books about grief. In my opinion, this is probably the most aesthetically pleasing of the adult grief journals I have. It has a nice blue cover with simple images throughout in nice, muted tones. It is understated and printed on nice quality paper. Other Comments: This journal has an envelope inside the back cover to store . . . well, anything you want: photos, clippings, whatever. It has a hardcover and the pages are spiral bound, making it easy to lay flat while write or drawing. It is a bit difficult to navigate, as it does not have a table of contents or index. You may have to flip through carefully and regularly to find the page(s) that apply to what you wish to journal about on any particular day. This is definitely a writer’s journal. Though there are many “blank” pages they are all lined. Though you could potential collage over the lines, the paper is lower quality and may not maintain its integrity if glued. This journal gives 30 very specific, concrete prompts and leaves plenty of room to respond (often 2-3 pages per prompt). 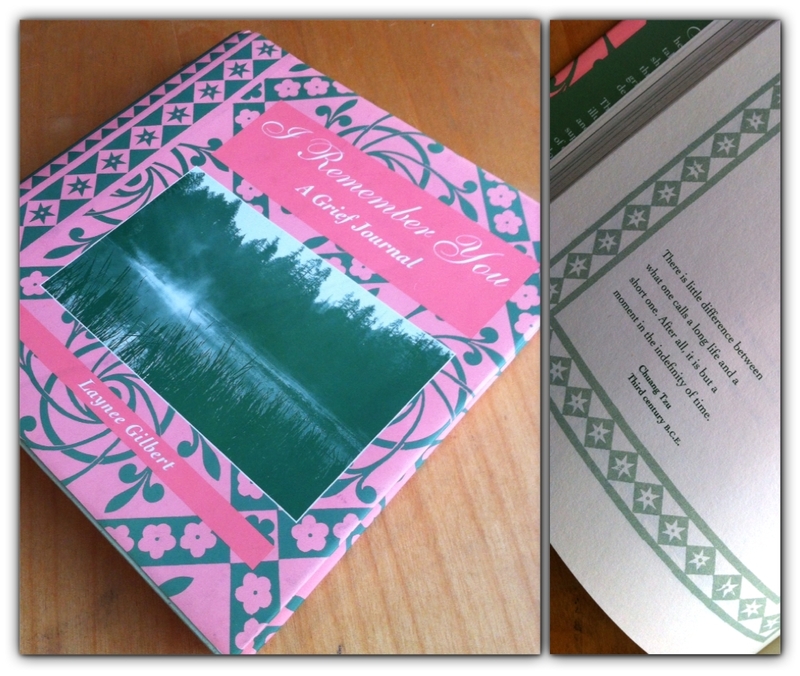 This journal for someone who wants to document memories, sprinkled with some exploration of feelings. Many of the prompts ask about very specific memories of your loved one. These range from favorite food, favorite holiday, favorite memory, funny experiences, mementos, last conversation, favorite story or joke, childhood memory, etc. This book focuses on the loss and the person who died. This is a short journal and may be a good, basic introduction to journaling around a loss. As the prompts are benign, if you are feeling apprehensive it may get you started with documenting memories. If remembering your loved one is still too painful and you wish to focus on the emotions around your loss, this is probably not the best fit for you. This journal does not contain information about grief and loss. This journal is a thin, basic paperback. It has an image of the sea on the front. The pages are very simple, lined pages with a few quotes sprinkled through the book. This journal is probably not ideal for someone who has aesthetics at the top of their must-have list. Other Comments: In this journal the author follows each prompt with her response (in just a couple of sentences). As I like journals as very personal keepsakes, I found it unusual to have someone else’s experience in the journal, but it may be helpful if you are very concrete and want furthering guidance, or tend to connect well with the losses of others. This is definitely a writer’s journal. Though there are many “blank” pages they are all lined. You could potential collage over the lines or glue a blank page over the lines if you wished to draw. The paper is higher quality and heavy enough that it would likely maintain its integrity if collaged over. This journal gives broad prompts with lots of room to respond (about 2 pages per prompt). These prompts are very open-ended and provide flexibility in the responses. There are also pages for specific time periods following the loss to document reflections from that time. This book focuses primarily on the loss and the person who died. This is a short journal but the prompts encourage reflection and self-awareness that will likely start at the death but may expand into other areas. This journal provides minimal information on grief. This journal is a thin, hardback book with nice, muted colors. The theme of a broken heart mended with stitches is woven throughout. The pages are printed on slightly cream colored, glossy, high quality paper. Overall it has a nice aesthetic. Other Comments: This is a Christian journal and includes Bible passages with each prompt. Many prompts also reference God and prayer. 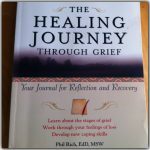 This is not clear from the Amazon description and may be a consideration for many people considering a grief journal. The book is thin with a hardcover, which seems durable and could easily be carried in a purse. Though this is only a small dent into my grief journal collection, I will stop for now for fear this post will become as overwhelming as all the Amazon options. Don’t worry, I will share more in an upcoming post (subscribe on the sidebar to the right to get an email with new posts). Have a grief journal you love? Have feedback on one from this list? Leave a comment! 10 responses on "Grief Journals: should picking a grief journal really be this complicated?" Essentially the best song ever! Litsa and Eleanor- Your site is one of my favorites!! Thanks for your review of A Time to Heal, a grief journal. I wanted to let your readers know we’re offering free shipping on this journal as well as the newly released- Grief Survivor~ 28 Steps Toward Hope and Healing, this week. (please email [email protected]) Merry Christmas, ladies! Thank you, Alice. I will have to check that one out! Your article and resources are very well done. It looks organized and thought out. Thank you for all the work you have put into this. As a Pastor, Hospice Chaplain and Bereavement Coordinator, I am always on the look our for good resources I can recommend to people, your Blog is now one of them. Well, thank you very much! We appreciate your support and are very glad you’ve found us helpful. Please let me know if there’s anything we could cover that would be helpful to the population you serve. Thank you for this list. This was a big help to me. I have considered purchasing a grief journal in the past but hesitated because I did not know what to expect or if I would like it. I looked in Barnes and Noble but could only find books about grief and plain journals. I couldn’t find actual grief journals to look at. I have tried to journal on my own in a plain journal but am not good at sticking with it. I think a journal like this might help me (it has been a few years since I lost my brother but I don’t think I really ever dealt with it). It is good to know what to expect if I order one of these online. So glad you found the list helpful. It can be tough to stick with journaling if it isn’t something you are used to doing regularly. Setting 15 minutes a day at a specific time can be a helpful way to get started and make a habit of it. Best wishes and let us know if you do pick a journal and how it works for you!